Friends! I’ve got a mini-vacation for you even if you’re not vacationing anywhere any time soon. After this discovery, you’ll feel as if you’ve been to New York City on a summer vacation…no foolin’. Author Sally Lloyd Jones has created an adorable children’s book which she says is a “completely true made-up story,” as parts are true, parts are amazing U.S. history, which history buffs will chew on, and the characters represent Sally’s relatives, however they live in England, not in New York City. Us adults will be charmed as well. I predict those of you anywhere close to NYC will go hunting for this fountain we’re about to learn about. I will for certain next time we visit. Goldfish on Vacation opens with three children, “H, Little O, and Baby Em,” proud owners of three goldfish, “Barracuda, Patch, and Fiss.” The children go round and round in their New York City apartment just like the goldfish go round and round in their bowl. Not such a fun way to start your summer vacation. Stuck. At the end of the street where the children live, there’s an old, abandoned fountain which in its day was a place for horses to drink from…until cars were invented. Because of the cars, folks no longer needed horses and the fountain became overgrown, abandoned, and a place for people to dump trash, sadly. Out of the blue, a man begins cleaning up the fountain, restoring it, complete with plants such as lily pads, suitable for a LOT of goldfish to inhabit. The children’s Grandpa marks their calendar accordingly. The fourteen days fly by and before they know what’s happening, the children can no longer see the man working on the fountain. It appears ALL the children living close by have arrived with their goldfish, swimming in their bowls, more than ready to let them have their own summer vacation. Let me pause here to say the illustrator, Leo Espinosa, brilliantly captures the plot of this story, offering the reader of any age to delight at the wonders on every page. (www.studioespinosa.com) You can see and feel the excitement of all the characters! Scores of parents, grandparents, and children all become friends because of their goldfish. Fever pitch jumping up and down, in and out of the fountain ensues, and suddenly, summer’s over and school’s about to begin. You may wonder HOW H, Little O, and Baby M get EXACTLY Barracuda, Patch and Fiss back home. Ah, my friend, you must read the book to find out. You’ll be grinning ear to ear. If by chance you live in NYC or near, head to Riverside Drive and 76th Street. 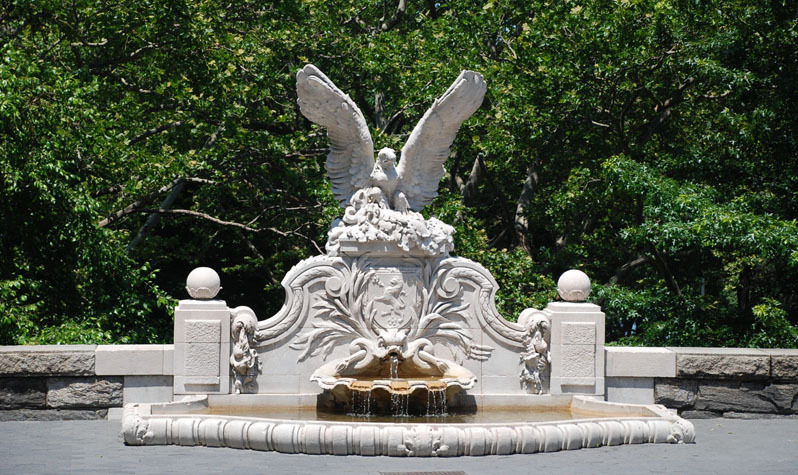 You’ll find the real-live Hamilton Fountain which is named after Robert Ray Hamilton (who lived from 1850-1890). He gave the fountain to New York and believe it or not, he just happens to be the great-grandson of one of our founding fathers of the United Sates: Alexander Hamilton. Don’t you history buffs just love that? Sally tells us a man by the name of Brad, who’s a volunteer for the Riverside Park Conservancy is who cleaned up the fountain. Bravo, Brad! Thanks also goes to someone who gave money for the fountain to be restored in 2009. Run, don’t walk to your nearest bookstore and grab Goldfish on Vacation.